Operation of the proposed Delta tunnels, according to the Department of Water Resources’ recirculated Environmental Impact Report, will reduce essential fresh water flows through the Delta to Suisun Bay and San Francisco Bay. Nonetheless, the State Water Resources Control Board has begun the permitting process to change the point where water will be diverted into the tunnels. The project is sold to the public as improving water quality, but tunnel proponents never explain that the benefits are solely for San Joaquin Valley agribusiness and the Metropolitan Water District, while the San Francisco Bay-Delta estuary takes all the negative impacts. That is why these questions need to be asked about water quality. Read Restore the Delta’s blog posts on water quality. The Delta consists of 5 Californian counties: San Joaquin, Contra Costa, Yolo, Sacramento and Solano. 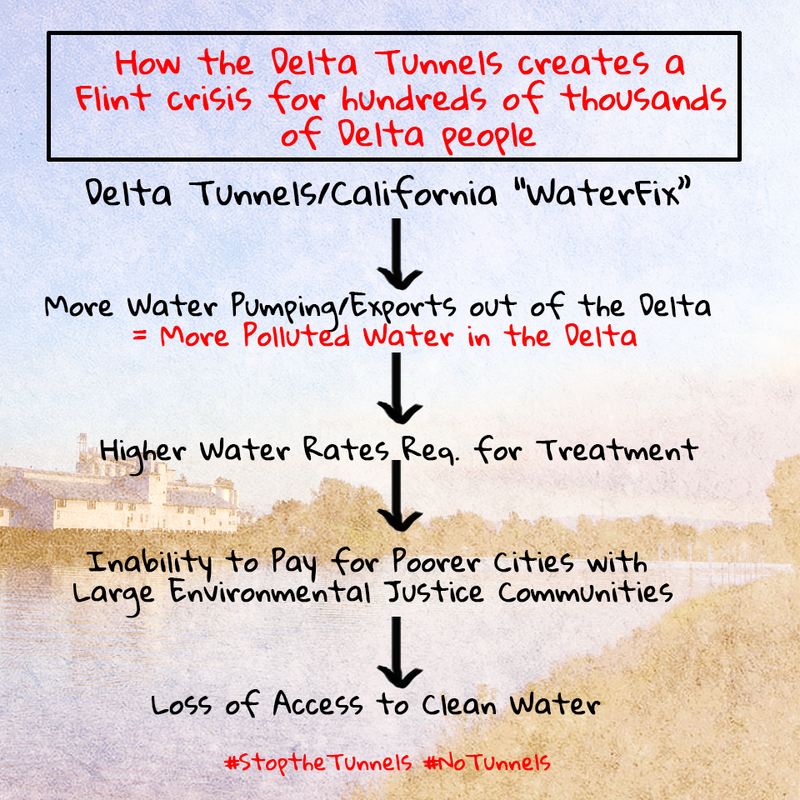 As in the case with the Flint, Michigan crisis, as water rates go up, economically distressed counties and cities will be placed at risk because they likely will not be able to afford to clean up the increased pollution that the Delta Tunnels will cause. How will the State and Federal Water Projects using the tunnels mitigate for these salinity impacts on fisheries, wildlife, drinking water supplies, and agricultural production? According to the new Environmental Impact Report (EIR/EIS) the reductions in fresh water flows will double outright violations of salinity standards along the San Joaquin River, and the lower Sacramento River, in addition to a 26 to 60 percent increase of salinity in habitat for fish, vegetation, and agricultural soils throughout Suisun Marsh. How will the State and Federal Water Projects using the tunnels mitigate for these potentially serious water quality, public health threat/public health impacts resulting from harmful algal blooms? Stagnant water in the Delta will increase because of Tunnel operations and climate change could bring more hot days. DWR’s recirculated Tunnels EIR/EIS acknowledges that this will increase incidence of harmful algal blooms. 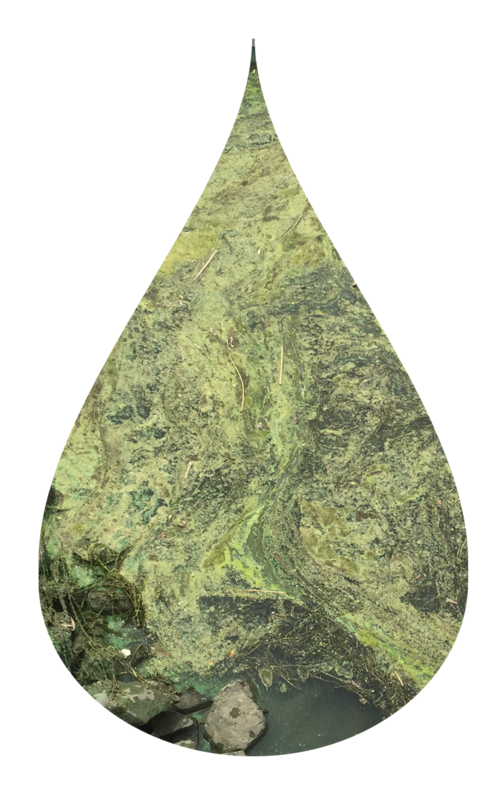 The most common blue-green algae species in the Bay-Delta Estuary is called Microcystis, and in 2014 DWR scientists found Microcystis late summer algal blooms running beyond October into December. Toxins from Microcystis blooms are deadly to wildlife, dogs, and human beings, and exposure can cause liver cancer in humans. It is a dangerous ecological and public health threat. The EIR/EIS for the Delta tunnels, it states, “It is possible that increases in the frequency, magnitude, and geographic extent of of Microcystis blooms in the Delta would occur relative to existing conditions” in comparison to the future condition of the Delta without Delta Tunnels. How will the State and Federal Water Projects using the tunnels mitigate for these serious water quality/public health impacts from Group A Pesticides? The San Joaquin River is an impaired water body for chlorpyrifos, diazinon, diuron, DDT, and Group A pesticides (human carcinogens) under the Clean Water Act. Increasing that river’s flow into the Delta will result in more concentrated pesticides reaching central and western Delta water ways from the San Joaquin, with longer residence times of these pesticides. The end result: the Bay-Delta Estuary would be left with a worsening dangerous pesticide “cocktail” supplied by the San Joaquin River’s agricultural effluent. How will the State and Federal Water Projects mitigate for MeHg bioaccumulation within the Delta with operation of the tunnels? And how will they protect people, fish, and wildlife from exposure to MeHg? Mercury is a toxic legacy pollutant left over from the Gold Rush. It continues to lurk in Bay and Delta sediments. Disturbance of sediments can stir up mercury so it enters Delta food webs. Tens of thousands of Bay-Delta residents fish the estuary for sustenance, and run the risk presently of eating fish contaminated with mercury. In its organic form “methyl mercury” (MeHg) is highly toxic and can pose a variety of human health risks. Last year’s EIR provided no mitigation method at all, just a list of “adaptive management” research issues to be handled later. The implied message is to “trust us” to build the Delta Tunnels project and BDCP will handle this problem later. For both tunnels construction and habitat restoration work in and around the Bay-Delta Estuary, DWR and its partners would have to handle MeHg contamination on a case-by-case basis. The new EIR/EIS shows fish tissue concentrations at several estuary locations would still be more than 1.5 to 2 times the USEPA’s mercury guidance concentration. This new analysis, however does not reflect California EcoRestore’s habitat restoration efforts, which cumulatively can be expected to have impacts similar to those identified last year for the Tunnels and the Bay Conservation Plan last year. How will the State and Federal Water Projects using the tunnels mitigate for an increase of selenium in the San Francisco Bay-Delta estuary? Especially if selenium mitigation efforts fail or are weakened in the San Joaquin Valley? Get this as a handout/document >> PDF version. A report by our policy analyst on these five questions is available at FAQs & Research.